BEST SELLER | Voltage is a personal favorite of Raquel Welch! This short wig is bold, textured, and features all-over layers that are feathered to perfection. The wispy bang and flared neckline make it gorgeous at every angle. This “shake and go” style can be styled soft and layered out of the box, or messy and modern using the Shaping Cream by BeautiMark. The Vibralite synthetic fiber looks and feels like human hair, and is available in a variety of salon inspired hues, also available in gray colors, beautiful shades of grey. The open sides and back allow superior ventilation making it cool all day. The cap features are designed to provide full coverage while maintaining a light, comfortable feel. The synthetic hair is pre-styled with flipped layers and is ready-to-wear out of the box. 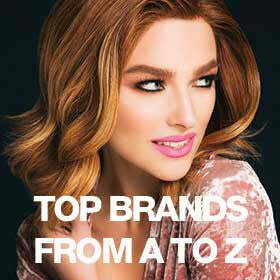 Every hair is perfectly cut and placed, making Raquel Welch Voltage Wig an all-time BEST SELLER! Voltage is also available in a large cap size and in a Elite version with Lace Front & 100% Hand-Tied Monofilament Top. Watch our Voltage video and read customer wig reviews below!